Newer dancers get apprehensive about dancing because there is not a large crowd for them to blend into. Energy levels in the room tend to remain slow affecting dancers regardless if they are experienced/new. The DJ has the trouble of dealing with a likely low energy room. For people passing by, event does not look impressive and for scenes that advertise with their dances this is a large negative. There are several ways to deal with this problem, each requiring a different use of resources. While the most obvious answer, this isn’t always the easiest one. The one thing a lot of scenes don’t have is a good habit of consistently advertising for their weekly venues/events. It is one of those habits that you don’t notice how much it hurts you until you neglect it for awhile. Is your organization website/facebook group/et cetera updated with information about the event? Are there fliers posted at relevant places (locally and regionally) advertising your event? Is there a well-designed facebook event online? Sadly, in spite of your best efforts sometimes this may not work. You could be a college town trying to compete with after-parties of a football game. Or you could be in the East coast where no matter what weekend you try to schedule your event, there are literally two other dance events happening the same weekend. Especially if you are paying to rent your dance space, there is no reason to spend the funds on a giant room if you are consistently getting not enough attendance to create a good atmosphere for your attendees. But many organizations have limited options for where to hold their dances based on availability and other factors, so scheduling a different room is not an option and instead have to work with what they have. I remember originally seeing this done in Oberlin, Ohio and I occasionally see organizers who value the atmosphere of a room doing this as well. How this works is using chairs and whatever else you have at your disposal, you organize the room so the dance floor is sectioned off. 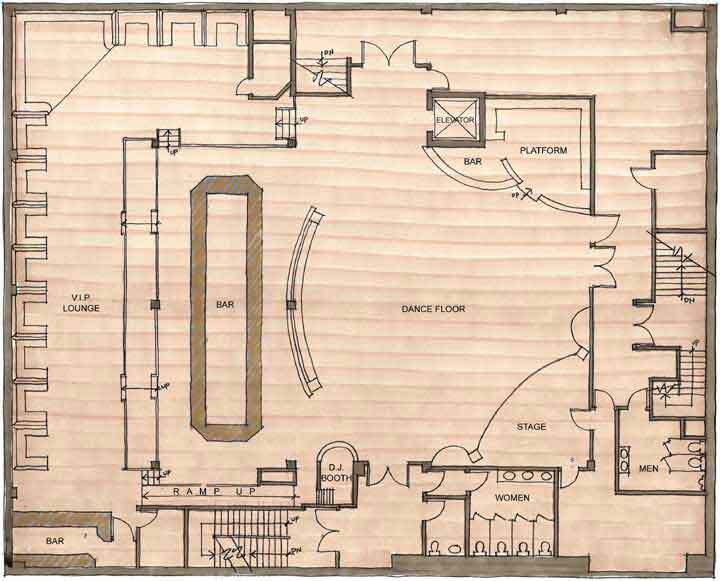 So here is a sample floor plan of a ballroom before the room is sectioned off. 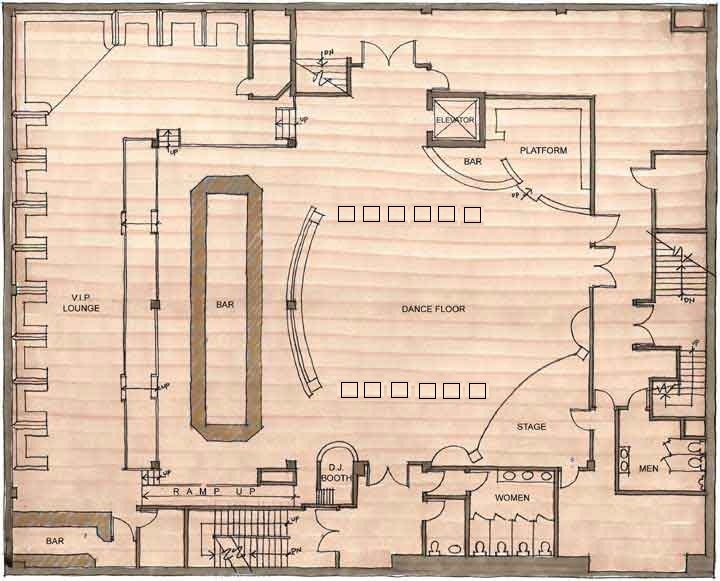 Here is a hastily made MS Paint diagram of the floor plan after the ballroom is sectioned off. The squares are chairs/potted plants/whatever one has at their disposal. Overall my recommendation is combining suggestions 1 & 3 together. Because suggestion 1 is full of things that should be habits if one is attempting to foster a thriving scene or a memorable event. However it is understandable that one may not always have the time/resources to do so. If you have any suggestions or tales of how your scene handles the situation of having an event in a large room with problems of low attendance in the past feel free to post in the comment section. This entry was posted on February 28, 2012 by Apache. It was filed under Running a Scene . When I ran the Iowa State swing club with my partner-in-crime MaryX we had a peculiar problem. Campus had AWESOME dance studios, and the grandest fragglerocking ballrooms just free for student org use. We loved the studios for classes and practices, but for socials we really wanted something more social. We made the mistake of booking the Great Hall. Amazing, beautiful, and gigantic. Heh. It was hard to fill, and in the next events, we went for the smaller spaces and that worked much better. It definitely is struggle if you have access to a giant beautiful hall/ballroom for free to choose between attempting to make it work via advertising/room management or to just use different rooms. The benefit of smaller spaces like you mentioned though is for volunteer organizations like a college campus that have limited resources (time & money) that they are fairly low maintenance in terms of setup compared to a larger room.